Now if I were an Abe government flack, rather than trying to ignore this graph or, when confronted with it, try to explain the fall in real wages away ("There will of course be a period of adjustment...but after a while we will see real wages rise again...") I would put the graph on the first page of every presentation on the future course of Japan's economic reforms. "Look," I would tell everyone, "the currency devaluation of Abenomics and consumption tax increase of Nodanomics, implemented in April --- see where the real wage curve suddenly falls like a stone off a cliff? --are doing exactly what they were expected to do. 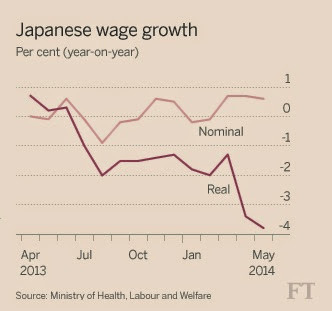 This is not a picture of Abenomics failing; this is picture of Abenomics and Nodanomics WORKING!" "Now the executives of Japan's multinationals can bank their currency devaluation boosted profits, leading to consumption to fall off a cliff too -- or they can buckle down and start raising national incomes by either paying more to existing workers, hiring more workers, engage in some capital expenditure or distribute the profits among shareholders. So I say to you top executives of Japan's largest companines, I know that a lot of you top executives are timid, self-pitying and avaricious tyrants -- not all of you, mind you, but a lot of you -- who will do what is right for the company books but is wrong for the nation and its people. Hear me, your country needs you NOW!" Oh, yes. Prime Minister Abe could also push up the real wages curve by using his big ruling party majorities in both Houses of the Diet to pass legislation further increasing the wages paid to bureaucrats and other government employees, reversing decades of wage and benefit cuts. Poaching a few corporate hotshots and putting them to work on the nation's problems would further foster the impression that in this blessed land there is a competition for talent, one for which Japan corporate heads will have to start loosening the purse strings or face being blindsided by defection. Wages are often the largest investment a business can make. Businesses will make an investment if they believe it's worth it, i.e. risk and return. You're assuming that business leaders here are tyrants and that they should for the good of their nation, among other things. However, I don't think that going bankrupt is good for employees or the nation. Nor should the government force companies to raise wages. A similar argument can be applied as the one argued for not raising the minimum wage -- up until recently the topic of debate in the US and other western nations. A government should be the referee, creating a fair game for the players, not telling the players what to do. I have fantasies sometimes too. Oddly, these companies, one of which I work for are sitting on a poopoo load of cash and are in zero threat of bankruptcy. It's more like having no new ideas and instead competing via cost costs or transferring costs to employees. And replacing full time with part-time temps to dispose of when things get slightly bumpy. The full time staff [seishain] gets bonuses (even those who reject new ideas as risky and continue along the same dive-to-the-bottom path.) while others on annual or part time contracts get nothing. Well, they do get company costs transferred to them. Not sure why, for Uncle Taro wouldn't let those most of those old geezers go bankrupt before the last light in a Japanese company in Tokyo went out.